We don't need to wax poetic on why the Brothers in Arms franchise is so successful, as that's one of the most popular mobile titles there is, and Gameloft released the next sequel just in times for the boring family reunions during the holidays. You play as Sergeant Wright after the Normandy invasion, of course, flanked by a set of "brothers," each with their own unique ability like Air Strike, Molotov Cocktail, Rocket Blast, Mortar Fire. Take on the gruesome world of WWII by upping their skill level and upgrading your weapons in mission modes as diverse as Assault, Sniper, Siege and Stealth. As for the graphics, the textures and 3D play have been drastically improved for an ever more realistic look over the battlefield, real-time weather effects, and amazing kill cam zoom on the enemy soldiers, all within a free movement action scenario. 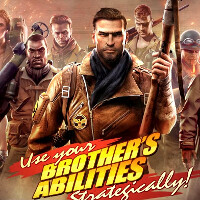 Take Brothers in Arms 3 for a spin from the source link below, and beware of the in-app purchases. Wow so Gearbox just handed their dumped Furious 4 assets to Gameloft and made a cheap cash-in game. also released for windows phone :/ why u no mention it? If you have to ask that on this bias site then you need to open your eyes. I actually quite fond of mobile fps. Take me awhile to master gyroscope aiming. IAP no way. I will wait for MC6. Its also available on windows phone ! Why you guys just care about other platforms I'm playing it , its so cool ! It's because they are biased. I don't even know why I bother with this site.